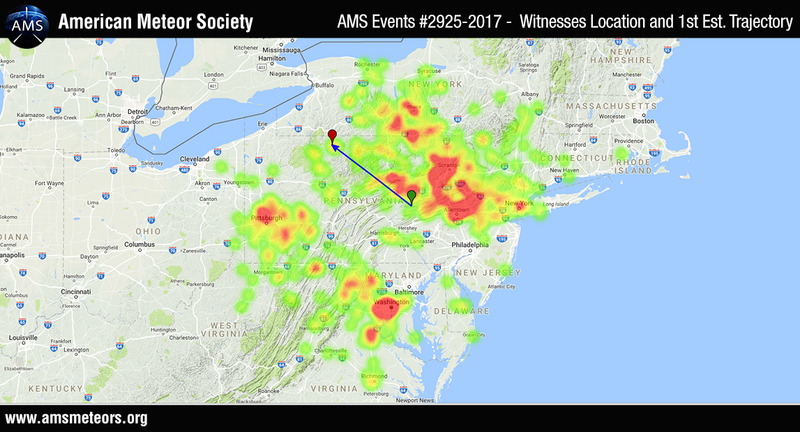 The AMS has received over 900 reports so far about of a fireball event seen above the state of Pennsylvania on August 25, 2017 around 9:14pm EDT (August 26, 2017 ~ 01:14 Universal Time). The fireball was seen primarily from Pennsylvania but was also seen from Ohio, West Virginia, Virginia, Maryland, New Jersey, New York, Connecticut, Rhode Island, Pennsylvania, Washington DC, and Massachusetts. According to our latest estimated trajectory, the fireball traveled in a southeast to northwest direction entering the atmosphere near Gratz, PA and terminating near Crosby on highway 46. If you want to learn more about Fireballs: read our Fireball FAQ. Vincent Perlerin, PhD used to be a researcher in Computational Linguistics. He is now a software developer, a web designer, a community manager, an illustrator and many other things. He is working on the American Meteor Society under the supervision of Mike Hankey. Vincent is the lead developer of all the AMS projects. He's also the lead developer of the International Meteor Organization Website and the IMO online Databases management system. We saw this from Trumansburg New York last night at 9:13 PM. I saw it too from Trumansburg, right after the power went out. It was spectacular! I remember seeing it that night at 9:13pm as well! I was right outside the North Star cafeteria at Cornell. I just looked over old texts to my friends. I had described the light streak as very big, and the colors as orange and green. I was out in my back yard in RAccoon Twp., Beaver County, PA and witnessed this event. It was a green fireball flying what I perceived to be south to north. I caught the tail end of it and saw the termination. Cool stuff. We saw it in the western sky from Palmerton, PA. It appeared to reignite for a brief moment after burning out. Beautiful! One question – we thought it was just the brightest meteor we’d ever seen, but it’s being called a fireball. Is there a difference? No difference, a fireball is just a meteor that is larger and brighter than normal. We were at the fair also and saw just a little bit off it through the trees! We were at the West End Fair in Gilbert Pa. We were facing west and it looked like it came from the south and headed north. I think it was about 9:15 pm. Didn’t see a lot of it through the trees but it was surely bright! Wow! My son lives in Mechanicsville Virginia. I love have to ask him if he saw this. Witnessed In Wellsboro, PA during Wellsboro-Canton football game. Amazing blue ball with green tail. My BF and I saw it at the same time in Wellsboro, PA. We were not at the game but sitting outside where we could here the band and announcer. It was an awesome site and I wondered if others had also seen it. Saw it from Frostburg, Maryland at the university star party!! my dad & i saw it in virginia at around 9:15pm EST, it was beautiful!! we both have seen quite a few meteors before but nothing that stunning and brightly colored…WOW!! Saw this from Mechanicsburg PA. It was heading northwest. The color and the tail were brilliant. It stayed in sight for several seconds. (Thought it was a Rhys Hoskins shot for a moment). Very interesting website by the way. We saw it on 8/25/17 at approx 9-9:15 from Dorney Park in Allentown, PA. It had a green trail of light. Very bright. Very exciting for our kids to see. Seen this last night around 9:15 at the Towanda, PA high school just after the football game ended. It was awesome!! Guessing it was a meteor, as I had seen one similar years ago while star gazing during a meteor shower in Dover, DE. Hope someone got a pic or video of this one. We saw it from Penn Yan NY. We were looking south when the green ball appeared – looked to be moving from east to west, and parallel to the horizon. Very bright. We saw it from near Martinsburg, WV, and could clearly see the green ball of fire and the “tail” – such detail and brighter than any other meteor I’ve ever seen. I saw this while I was in Coaldale, Pennsylvania. Myself and 2 friends witnessed this event last night in Painted Post, N.Y.. It was very bright and not very far above the horizon. This traveled from a SE to NW direction. Quite spectacular!! I saw it in butler county ….I had just left the city of butler heading toward chicora and saw it streak across the sky…. knew right away it was something extraordinary! Saw this in Wilkes-Barre PA around 9:13pm on August 25th 2017. I was in the car with my cousin and we were in front of my house. She didn’t see it, I had my phone in my hand but it was too quick to even get a video or picture, in fact it was gone with a blink of an eye. I found out other’s have witnessed it from a facebook group, I thought I was just seeing things. It almost looked like a big firework and I realized it wasn’t when there was no loud boom and it was too fast for me to even think it was a plane. Four of us were sitting by a fire 2 miles north of Bradford New York. We were facing south east. I saw the fireball traveling from left to right about 30° above the horizon. All four of us saw it. It was about the size of a baseball and was emmiting what looked like flames. It took about five seconds to cross our line of vision. We all thought it was traveling from North East to Southwest . I saw this coming home from FOOTBALL game in Athens,Pa. I saw it driving west on Route 80 after 9 pm. It went from south to north. To me it looked like a color ball at the end. It was an amazing sight. My wife and I saw it as we drove through the Manassas Battlefield in Nierhern Virginia. It was very vivid and seemed to last a relatively long time. I saw it clearly, I must have been looking in the right direction at the right time. I was outside around 9pm, on the 25th of August, 2017 and saw this blue-green ball of light travel across the sky in Strasburg, VA. Amazing! Confused how it was predicted to have terminated south west of us when it appeared to be traveling north west.of us. We were traveling north on Interstate 81 from Winchester Virginia and almost to the West Virginia border line when we saw the fireball. Luckily the sky was clear and it was an awesome sight. The colors of the fireball and the trail/tail were so vibrant! It was pretty exciting! We saw this fireball all last night. It was traveling south to north from Ridgway, PA. The brightest I’ve ever seen and huge! I had enough time to say ‘what t he hell is that? !’ Everyone turned and saw it also. Amazing! We saw it in NW NJ – western Morris County, on top of Schooley’s Mountain in Long Valley. Moved slowly, large and bright – greenish/blueish color with a yellow/orange trail. Large enough and slow enough to catch our attention through the window while indoors. My friend and I saw it while drinking in on 80w. I think we were near Denville at the time. Absolutely amazing! I saw it in Sayre, PA (on the NYS border). Traveled east to west, appeared as white light to me, and I saw a tail. Lasted at least 7 seconds. It appeared to “go out” then briefly reignite before disappearing. I saw it from Ridgway, PA…… It was incredibly bright and I watched as it burned out. Interesting that they think it terminated near Crosby, about 45 miles from where I was. We saw it in Westwood NJ. It was crazy! We were at an outdoor concert and we looked at each because we couldn’t believe what we just saw. Observed it from Williamsport, PA. From directly overhead to W horizon. Most spectacular. Suspect it was a once in a lifetime event. Me and my wife saw this event 9:14 pm from flemington nj coolest and biggest fireball I have ever seen!!!!!!! Saw it from Marion, Pa while walking my dogs. Moving North West. Pretty cool. Saw this VERY clearly while traveling on route 22/30 east near the Burgettstown, PA exit. It was absolutely amazing. Extremely bright green/blue. Saw it for quite a while as it trailed across the sky. One of the coolest things I’ve ever seen. My daughter and I saw this last night in MD. Truly the best and brightest I have ever seen!! It seemed to have almost every color of the rainbow in it. Was this considered a rather large fireball? We were sitting outside in Mansfield Pa watching the beautiful night sky. My mom saw it first then my sister in law Carolyn started watching it and thought it was a plane but realized it was too fast then it shot overhead to our right and it was fabulous. We knew right away it had to be a meteor event but didn’t know about fireballs. It was so cool and clear as day. Carolyn’s son saw it too, he was driving on the highway below Scranton on 81 and our nephew Nate saw it in Brockport Ny when he was out filling his car up with gas! My 85 year old mom was thrilled to be star gazing and have this experience!! Observed from Ohio Pyle area (Tall Oaks Campground). An Epic ending to our Eclipse week . Observed for about 5 seconds to ending. VERY COOL!! We saw it Friday night in Uniontown PA during a highschool football game. Observed in Mt Pleasant PA around 9:10 pm. It was huge!! My husband and I saw this while driving north in Orwigsburg, Pa. We immediately thought it was a meteor and my husband even got the goosebumps – we have never witnessed one before ! Absolutely stunning! Viewed from Horseheads NY, facing west in parked car. It lasted a very long time. Mostly green with hint of blue. Saw a red dot travel further for less than a second after color disappeared. I told a passenger in car to look at the meteor, he said “I missed it,” I said “NO! LOOK!” it was lasting so long, he leaned forward to look out windshield and caught the end of it. Seemed to last over 3 seconds, close to 4. We saw it in Elmira|Big Flats also. We saw it in Smethport PA. It lasted about 5 seconds, shooting across the sky then we could see it burn out. It was very cool! We saw it in Falls Church, VA. I’ve never seen anything like it – very bright, blue/red trail, moving slowly (slower than a shooting star – faster than an airplane) from east to west. Amazing. Seen it driving on 33 South leaving the Stroudsburg Pa area. Saw this near Laflin, PA. Was really an incredible sight. Seemed so low. I seen the fireball in Paxinos, PA. Thought it was a shooting star with the brightness until I seen the fire behind it and how big it was. Saw it continue towards earth before disappearing behind trees. My mom and I saw it in Tunkhannock, PA. It was the longest, brightest “shooting star” I’ve ever seen. Witnesses this beautiful fireball in Wilkes Barre, Pa. It was low on the horizon. It was big beautiful and bright leaving a colorful trail behind it. What a spectacular sight to see! My wife children and I saw it in Delano pa. We were sitting next to a fire. Saw this from Mechanicsburg, PA. From what we could tell, it was below the cloud layer. My neighbor, an air traffic controller, said the clouds had been at 6k feet. As we were driving home we saw it in New Kensington, PA. First time that we both saw a meteor, it seemed to streak right past us. Very beautiful. I thought we were seeing things. My daughter saw it above McDonalds in Lower Burrell too. She was delivering pizzas and said she screamed in her car. Several of us saw this at the West Scranton v. Dunmore football game on Friday. Guess this was bigger than we thought- oddly enough, it was burning green from what we could see. We were having a bonfire in Allenwood Pa and most of us saw it! I was lucky enough to see this rare event I’m Friendsville, MD! Absolutely amazing!! A friend of my son’s was driving down our street during the event, saw the fireball run overhead then stop and drop in a farm field a half mile from our house. He said it looked blue. We were at the Trumansburg fairgrounds 1.5 miles away and saw a green fireball fly by. Three of us walked the field with lights then also in the dark on a meteor hunt if you will. Two are teenagers so it was a lot of fun even though we did not find anything. Do they burn out entirely or would we have found something in the field? What would we be looking for anyway? Due to the lack of reports indicating sound along the flight path it does not appear that any fragments of this object made it to the ground. If fragments did reach the ground they would look like dark colored rocks unlike most that you would find in this area. Sometimes these rocks are magnetic if they have a high metallic content. We saw the meteor while camping up in Dolly Sods West Virginia. No light pollution as were many miles from any town/city ground lights. No moon, nor clouds.Sky was very clear. Unobstructed view. The fireball was a brilliant emerald green color and lasted for about 2-3 seconds. Just above the treeline. Tail of fireball was blue green. Large size, brilliant and a most amazing sight. I am in Mill Hall Pa, and seen this last night at 9:00 pm. I was standing on my porch and a bright flash in the sky caught my eye. I looked up and seen it flash again in which seemed to be the same spot and were very bright. It was a bright white flash to me. But the flashes were probably 15-30 seconds apart. And as I continued to watch I realized it was moving very slowly off into the distance and higher into the sky, with the brightness of the flashing fading away. It waa not a plane I know that for sure because I could see planes flying with their continuous blinking lights and it was a completely different sight and much higher then the planes flying. I also didnt see any tail or trail to the flashing movement. I waa very confused at what I was seeing and made a Facebook post about it to see if anyone else in my area had seen it but no-one had. But received a responding post today about this fireball and now I’m certain it’s what I had seen! I was in awe of what I was seeing! saw it in Carbondale, PA. Up near Scranton. it was beautiful. blue and green lights followed by a long, reddish trail! We witnessed it from Avoca, PA. Most impressive meteor I’ve ever seen! I saw it while walking out of the southern Columbia vs shamokin game at shamokin. Bright red spit with greenish color glowing tail. Moving very quickly. Knew wasn’t a shooting star but wasn’t sure what it was. Was pretty neat to see tho. Just got back from cape may, NJ. Sitting on my neighbors porch in Turkey Run PA. When my wife and I saw the most amazing green and blue fireball. It was visible for between 5 to 10 seconds. 2nd best one I’ve ever seen. We Live in Waverly Pa. My Husband and I saw it!!!! I saw it in Connellsville PA. The biggest I’ve ever seen and traveling south east to north. Traveling parallel with the horizon for about 8 seconds. Beautiful!! Many people saw this…but I’m wondering if any sound was associated with it? Out of 700 reports only 6 reported any sound related to this fireball. None of them were particularly close to the flight path so I am include to believe that these sound were not actually related to the fireball. I saw it travelling from South to North outside of Coudersport,Pa. Saw this amazing fireball at a Railroad Earth/Greensky Bluegrass concert, in Mt Pocono PA. Witnessed by most at the concert, even the band paused for the 7/8 seconds it was visible. I was at the show too, and yes the fireball made an already truly memorable night even more spectacular. The crowd expressing a collective Ohhh confirmed that they were all seeing what I was seeing. The low flying plane right over the crowd minutes later added to the unique feeling of connectivity. Multiple people in Ithaca and Trumansburg, NY, reported hearing something like “gunshots” at about this time on a Facebook group I belong to. I was camping at Timothy lake in east Stroudsburg pa and saw it. It went from the left to the right, It was pretty low, very bright! It was red and green and truly the most amazing sight. Wish I got a picture of it! I saw it from Twin Grove camp ground Pine Grove, Pa. Appeared to have a lot of green light visible. Yes, we saw it in Lake Ariel, PA. It was amazing. My son also saw it in NEPA thinking it was a shooting star. I was outside with my dog in Drums , PA and saw it crossing the sky. It was very bright and had a bluish and orange color tail. I waited to see if I could hear any noise because I thought it may impact or explode. I didn’t hear anything but it sure was beautiful to see. That night we had a fire pit going with family and friends in my back yard in Carbondale,Pa. It was a beautiful night. In the southwest you can see a crescent moon and Jupiter in the sky. When I looked again I saw a slow moving streak in the sky and yelled to everyone to look in the direction of the object, It looked like multiple objects in a very tight formation. The colors were bright green, yellow and white it was a strange but a beautiful sight to see. It looked very close as though it would strike the next town. Saw this over Williamsport, PA! It was amazing! I was driving (actually stopped in traffic) on rte 78 in New Jersey and saw it cross the sky. It lasted at least 30 seconds. Was so bright-a fireball across the sky! Saw this at the Wallenpaupak game in Hawley, PA towards the end of the game. Beatific colors of green and bluish. I thought it was a firework. My mom and I saw it from Watsontown Pa. It was amazing!! Seemed like it was moving in slow motion!! Did you by chance get a pic of it??? There is one decent video and a couple indistinct video available at: http://www.amsmeteors.org/members/imo_view/event/2017/2925. the one picture posted there is also indistinct. Thought what we saw was a firework during the Nazareth, Pa football game, until I saw this post! We too saw a green fireball with a tail! So cool! SOS: If anyone has a picture of this PLEASE reply to me! I got engaged and said yes when the meteor went overhead. The people around told me about it and said how beautiful it was, but I never saw it. I would love to have a picture of it to remember the night so special to me. Thanks! I saw it in Cresco Pa ( the Poconos ) It was about 9:15 and the fireball was heading from southeast to northwest. I had a very clear view. It started out in the distance as a bright light turning orange and blue as it got larger with a green tail as it headed northwest. It was beautiful ! I was just leaving grocery store in Freeland PA (approx 9:10pm) when I looked up & saw this flame moving. Simply amazing. Saw it clearly in Union County, PA. Took the dog out, and saw a beautiful astronomical event. So cool. I did as well, in Rochester, right around 9pm. I was driving from work to pick up some dinner. Amazing! Greenish light, heading right over I-590. My son and I saw this while driving south of Norwich, NY. Or saw another similar one. Could there have been more than one? Many people outside the area of Pennsylvania marked on the map saw it. While a majority of the reports are from Pennsylvania, there are also many reports from surrounding states. I believe you all witnessed the same object. Saw this from Pittston, PA around 9:15 p.m. on 8/25/17. Saw a bright fireball with green tail heading to the north around 9:15-20PM August 25, 2017 from White Oak PA (just on the outskirts of Pittsburgh). It was tremendous and was quite big and low in the sky. Seen from Mt. Pocono, PA. Bright green, almost crossed in front of the rising moon! Appeared to break up into smaller fragments as it disappeared. Brightest I have seen in a couple of years. Saw the fireball in Beech Creek, PA. while camping with family. My husband and I saw it in Brunswick, MD. It had a blue/green color. Very neat to see. Just found this site. My wife, Mother-in-Law and I all saw this. It was bright green. It lasted for an unusually long time. We were sitting on the beach on Cayuga Lake, in King Ferry, NY. All three of us saw it. It was spectacular. I wish I had my camera ready. We were sitting around a campfire in our backyard and saw the fireball. Very interesting. My wife and I were returning home from the Bluegrass festival in Lodi New York south bound on route 14 just below Watkins Glen and I said look look look with enough time for her to still view it. First one I have ever seen. But I have to say that with the spoiled leader in North Korea it was a little uncomfortable waiting for the impact. The next day many people at the Bluegrass festival also said they saw it. God is great ! A group of us saw two green fireballs come across my yard heading west. I live along the PA turnpike near Harrisburg East Exit. This occurred between 9 and 10 PM on Fri Aug 25,2017. They seemed lower and almost slower then an airplane and we get low flying airplanes because of living close to airport. We saw it in Windber, PA…. definitely a cool bright green! Wittnessed this beautiful fireball over Mount Pocono PA during a music fest with Railroad Earth and Greensky Bluegrass. The bright greenish white light crossed in front of the crescent moon traveling in a high left position to low right. The fireball was seen by many in attendance of the music fest. The crowd at the Greensky Bluegrass/Railroad Earth show in Mt Pocono Pa made an audible “whoa” when that thing went overhead! It was amazing to the extent it was almost scary. Seemed to go slowly and extremely bright green with a long tail of light Spectacular, and I’m so thankful I got to witness it!! Amazing! I was at a small music festival in Austin, PA when I saw it. Truly Amazing!! Seen in Latrobe PA! Saw this in Cross Fork, Potter County, PA!!! I was driving west on RT 11 between Berwick and Bloomsburg. I saw this appear in the sky overhead and make a slow, shallow decent to the north until it disappeared behind a hill. Very bright white with a green tint. It was so amazing and surprising to see! If it had been the 4th of July I would’ve though I was seeing a glowing ember from a nearby firework. Saw it over Exeter PA! I told my friends I thought I saw an alien landing and they thought I was drunk lol. Was pretty slow not as fast as a shooting star, with a green hue to it. Now I know I’m not crazy!! I got drunk on fireball! Saw it in St. Marys, PA. I was in the middle of nowhere (New Albany, PA) lying on my back on the roof of a friend’s house. This was absolutely amazing. It was so bright and clear it was like i was watching an HD movie. I could almost make out the shape of the “rock”. I saw it fly over Lernerville Speedway, the color was super vivid. Red on the nose, ball was mostly yellow with a very long blue green tail. I was viewable for a solid 5-6 second as it crossed the sky. Awesome way to end eclipse week!! Seen in NYC and it terrified us. From the roof of a open air Double Decker bus sightseeing, we were on the Manhattan Bridge looking at The Freedom Tower. It appeared as a large light heading towards the tower then rapidly sped towards it, several people screamed “oh no, not again”, then it turned brilliant green and we lost it behind the tower. A guy yelled “look, a shooting star”, by then we all figured it was too fast and bright to be.. well.. you know. Keep in mind we were downtown NYC, where you see absolutely zero stars in the washed out sky, a shooting star was most definitely not something I thought we could see. I was at my campsite Secluded Acres near Lake Ariel, PA. I saw it, really big meteor and it seemed to be low, at first it was yellow, but then it turned blue and finally green. Just maybe 10 secs then it went behind the trees in the woods. It was the most awesome experience I’ve had in a very long time. We saw it in Greencastle. It was a really cool thing to witness. I saw it, along with several other friends, at the “Pickin’ in the Pasture” Bluegrass Festival, Held at the Alexander Farm, Lodi, NY. Spectacularly bright, long, green. i”m hoping to find a pic or video of it from someone! Is this the same one I saw after 11 p.m. Hayward California, passage easterly to westerly, very bright, Aug 28 2017. Your event was an entirely different one. You are located too far away plus it was traveling in the wrong direction. I live about 15 minutes south of Pittsburgh & I was just parking my car about 9:30pm and the sky lit up brighter than I ever saw before. It was a strange color. Almost a green shade. It turned daylight for a brief moment, that’s how bright it was. I got out and didn’t see anything, it was partly cloudy here. So I got back in to finish parking and it flashed 2 more times quickly then that was the end of it. I had been wondering what it could of been till I came across this site. Now I know.